Note: By 1974, all privately owned rural companies had merged with Island Tel. The South New Glasgow Rural Telephone Company was the final company to turn over its franchise to Island Tel on May 29, 1974 when Island Tel prepared for dial service in the area. Thus ended an interesting period in P.E.I. telephone history. York Point Telephone Company (1922), 40 customers in Cornwall, West River, North River, and York Point. Brackley Point Road Rural Telephone Company, Ltd.
Crapaud - Northern Union Telegraph Company (1895). Augustine Cove and Tryon Mutual Telephone Company (1915), 30 subscribers. Kelly's Cross Rural Telephone Company (1919), 2 subscribers. Tryon Rural Telephone Company (1930), 14 subscribers. Marshfield and Dunstaffnage Rural Telephone Company (1919). Iona Rural Telephone Company, 2 subscribers. Mayfield/Cavendish Rural Telephone Company (1915). Oyster Bed Bridge Telephone Company (1915). Malpeque Rural Telephone Company (1900). Darnley Rural Telephone Company (1900). Hamilton Rural Telephone Company (1914). North Milton Rural Telephone Company (1919). North Wiltshire Rural Telephone Company (1922). Savage Harbour-French Village Rural Telephone Company (1917). Pisquid-Peakes Rural Telephone Company (1924). Cherry Hill-Head of Hillsboro Rural Telephone Company (1928). Sturgeon Rural Telephone Company (1922), 3 customers. Southern Rural Telephone Company (1924), 6 customers. 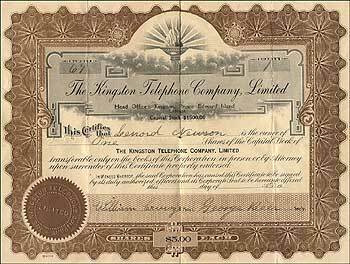 Kingston Rural Telephone Company (ca.1922-1941+) - William Cruwys, pres., George Beer, sec'y - see stock certificate shown above. Argyle Shore Rural Telephone Company. Canoe Cove Rural Telephone Company. Nine Mile Creek Rural Telephone Company. West River-Rocky Point Rural Telephone Company. (1911) - Obituary for Anna Grace (McNeill) INGLIS that appeared in the November 11, 2004 issue of the Guardian: "The first telephone call made on the West River Telephone Company was to summon the doctor for Gracie's birth on August 31, 1911." Lot 7 Rural Telephone Company (post WWI), 55 customers. Springfield Rural Telephone Company (post WWI), 38 customers. Forestview Rural Telephone Company (post WWI), 7 customers. Brae and West Point Rural Telephone Company (post WWI), 65 customers. South New Glasgow Rural Telephone Company (-1974). North Shore Rural Telephone Company (1911). Greenwich and Cable Head Rural Telephone Company (1925). J. H. Myrick and Company (1888), 3 customers. Ellerslie-Conway Rural Telephone Company (by 1916), 40 customers. Mt. Pleasant Rural Telephone Company (by 1916), 2 customers. Northam-Arlington Rural Telephone Company (by 1916), 32 Customers. Cherry Valley-Earnscliffe Rural Telephone Company (1918). Grand River Rural Telephone Company (1914). Mount Carmel-Egmont Bay Rural Telephone Company (1916). By 1932 there were 45 privately owned companies. Some other companies may have been amalgamated with the Prince Edward Island Telephone Company by this time, so I may still be missing some. If anyone can fill me in on any I missed, I would appreciate it!. "St. Anne's, Lot 22, P.E.I. Our rural telephone extension from New Glasgow Mills to St. Anne's, Hope River has been completed for some time, and is now in active operation. The length of the line is exactly three miles as determined by actual measurement. I should now be pleased if you could find it convenient to send us a cheque the amount of the government subsidy. P.P. McGuigan, Esq., J.P. of this place testifies that the work has been satisfactorily completed. Yours truly A. McAulay "
I hereby certify that the rural telephone line running from New Glasgow Mills to St. Anne's, Hope River has been satisfactorily completed and is now in active operation. Now, here is an interesting project. Eventually all rural companies became part of Island Tel. We know the agent of the Tyne Valley Exchange and its operators when Tyne Valley changed over to dial due to the research into the history of my board. What now would be an interesting project, and this I need your help for, is to identify the year of changeover, agents, and operators of other exchanges on the Island. Please, if you can help with any exchanges, please contact me by clicking on my name at the bottom of the page! Can anyone add to this listing? Note: Much of the information for the above listing added with the help of an excellent book, "Voices of the Island", by Walter C. Auld, Nimbus Publishing, 1985. Alas, this book is now out of print. Walter, resided in Charlottetown and Stanhope and was an valued employee of the Island Telephone Company from 1936 till 1980. Through the years, he advanced through the company hierarchy to executive vice-president, and retired January 1, 1980. In 1985, he was asked to write the company history, and "Voices of the Island" was the result. Walter passed away recently. This copy was loaned to me by the Abegweit Chapter of Telephone Pioneers of America - my thanks to Holly Laroque, President of the Abegweit Chapter, who has been most helpful. It is a wonderful book, and would be of interest to anyone with an interest in the history of the telephone on P.E.I., or with family members that were employees. Try the used book search engines to find it. Currently, there are a number of copies available on them - I have ordered a hard copy version of the book. Sadly, Walter passed away May 20, 2008.